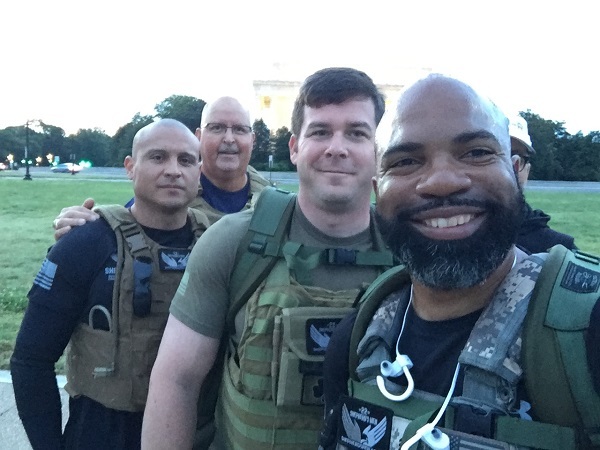 Wounded warrior Jarrad Turner gives back to brothers in arms by connecting veterans with the military benefits they earned during their service. ATLANTA (June 27, 2017) – Just days after returning from a grueling eight-day run and march, Jarrad Turner was back in the gym. Jarrad was also back on the job at Wounded Warrior Project® (WWP) connecting veterans with the military benefits they earned during their service. For more than a week, Jarrad joined other veterans, volunteers, and supporters to increase awareness about veteran suicide and raise funds to treat post-traumatic stress disorder (PTSD) and traumatic brain injury (TBI) at the Shepherd Center in Atlanta. Participants in the run and march progressed about 22 kilometers (15 miles) per day through eight cities from Shanksville, Pennsylvania, to Atlanta, carrying 22-pound vests to signify the 22 veteran suicides per day. Some days, members of the group carried an additional 71 pounds in their rucksacks, bringing the added weight total to 93 pounds, representative of Flight 93. On that flight, brave passengers brought the plane down to stop terrorists from using the jetliner as a weapon. The memorial to these passengers served as the starting point for this journey. With each stop along the way, the group shared its message and its mileage. These opportunities opened up the eyes of veterans like Jarrad. So why did Jarrad run 120 miles? Jarrad has taken part in the run and march with Shepherd’s Men for three years. Each day is a new journey in itself. “Going to the Flight 93 memorial, listening to some of the phone calls and voice mails that passengers left for their families. These passengers made the decision to take that plane down. But they don’t get the recognition victims in New York and at the Pentagon receive. Jarrad said one of the toughest things about the run and march is being away from his family. For more than a week, Jarrad joined other veterans, volunteers, and supporters to increase awareness about veteran mental health. Jarrad hopes all veterans take one thing away from his journey with 14 other veterans and supporters. While Jarrad is still recovering from the run and march – he said it will take at least two to three weeks – he already knows he will be involved again next year. When asked about this same grueling 120 miles in the south, in the summertime, he hesitated but answered with resolve. WWP connects veterans with one another and serves them with life-saving programs and services targeting mental and physical health and wellness, career and benefits counseling, and long-term support for the most seriously wounded. WWP empowers warriors to live life on their terms and mentor others. Learn and see more about Jarrad’s journey at newsroom.woundedwarriorproject.org, and click on multimedia.